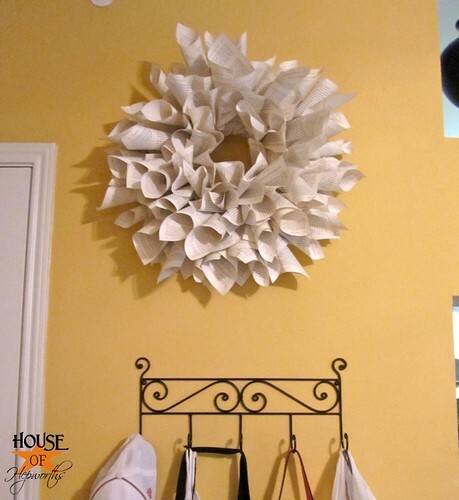 Wanna see THE wreath that started this blog?! THE ACTUAL real-for-real wreath that had me so smitten that I asked my sister Lindsey where she got it and she said she made it from a blog online called Living with Lindsay (no relation) so I started reading Living with Lindsay which started the blog obsession which prompted me to start House of Hepworths, formally known as aheppy (for like 2 seconds, until I found a less dumb name?)? Ya, that wreath. Wanna see it? It was a cold and dark night in late December of 2008… Kidding. But for real, some time in about 2008 I saw this wreath, started OBSESSING about it, asked my even-more-hilarious-and-quirky-than-me sister Lindsey about 10 times “WHAT was that blog again where you made your cute wreath?”. Finally she posted it on my Facebook wall so that I would for-the-love-of-everything-crafty stop asking her already. Lindsay is NOT that hard a name to remember after all! ever again. And I respect Ben and Lindsey waaay too much to go behind their backs and show you that photo even just one.more.time. 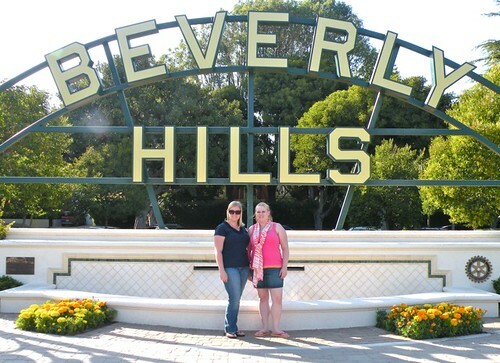 You can’t really see our faces very well, but I really wanted to just brag through subliminal message that we’ve been to Beverly Hills. THE Beverly Hills. And we lived to tell the tale. I’m pretty sure she felt so dumb after that. Poor lady. She seemed so embarrassed yet also shocked that I’d actually lived in THE Beverly Hills. She probably reads my blog (yes, I’m that conceited to assume everyone I know reads my blog) and now hates me. (disclaimer: we lived there for 6 months for Ben’s job. His company paid for it. We’ll never be that rich! lol). Lindsey is one of my favorite people on this planet. In addition, she’s crafty. She came over a few weeks ago and wanted to borrow my Silhouette so she could cut out some vinyl. Never one to turn down a chance to use my toy (minds out of the gutter people! Geesh. ), I obliged. How cute are those?!? Srsly. I’m just pissed I didn’t think of it first. Damn you Lindsey. They were so easy to make, yet they are so fun and creative and just plain adorable. She bought white frames (I’m thinking from the dollar store? ), backed the glass with colored paper, and then stuck the vinyl to the front of the glass. Do you notice Lindsey’s GREEN walls? And her wreath wall was yellow?! She has such bold style that I’m too skeered to even attempt to pull off. Fun to the double N I tell you. One day, when I can get her to clean her whole apartment in one day, I’ll take a photo tour for you guys. I love her style! See what I mean about cleaning? I should have at least moved the cookie sheet, rag, and other stuff out of the way first. Bawhahahaha. 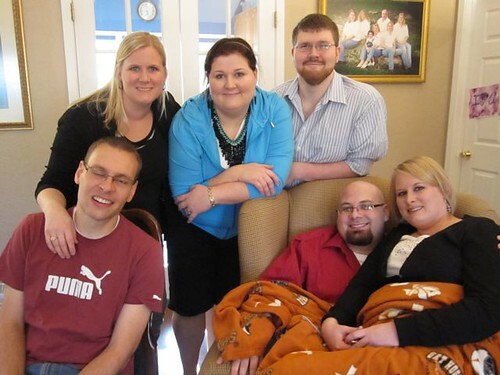 Well, my BFFs (yup, we are all besties now), you have now officially met my sister Lindsey. She’s real. And she’s fun. But she’s just not Real Fun. Bada-bing! Tip the waitress, try the veal, I’ll be here all week. She doesn’t have a blog, so feel free to tell her how awesome she is in my comments section. I may or may not tell her. I wouldn’t want it going to her head, you know. Haha. You crack me up! I really like the book wreath!! In other news, I was scrolling down the page and for a split second thought the google ad in your right side bar was a button you had put there. And for another brief second thought that the header was “Babies Vaccine.” I did a what the what?! And scrolled back up only to read that it was a Frontline ad for Rabies Vaccines for dogs. Those are so cute I might have to copy. Your sister is adorable and of course you’re adorable. Thanks for the big hugs. They are greatly needed. 2 steps forward, one step back. It’s hard but we’ll make it. Thanks for keeping us in your thoughts. If you ever find yourself in Utah we should get together. You are hilarious. Love it. Loving the silhouette frames… might have to try those soon! so cute! (as always). I want to know what wall color lindsey’s paint is. I’ve been looking for a good green and yellow, and those are both such nice colors. 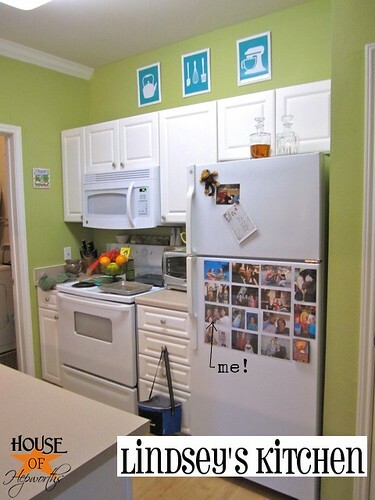 So great to meet Lindsey and her kitchen art is fabulous! I love her green walls!! 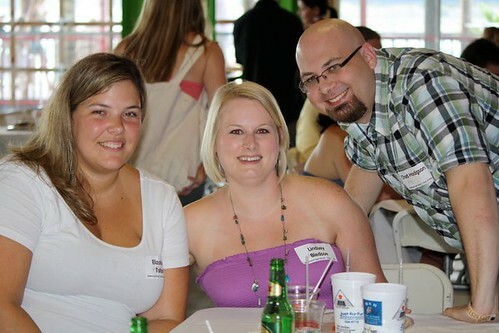 But I didn’t look at the photo…no way…I didn’t want them to be upset! Well, I did peek a little. 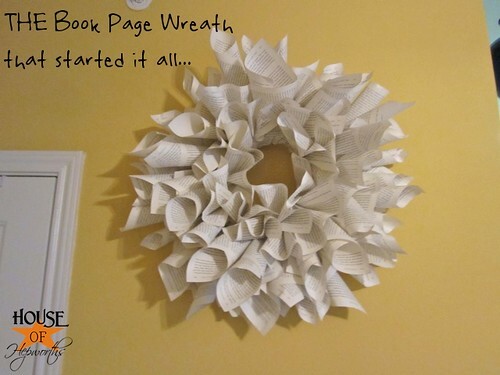 A book wreath has been on my “to do” list for about 6 months…. good to know that I don’t hold the record for longest procrast on a book wreath! 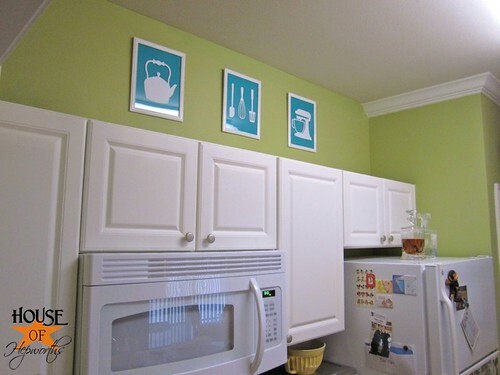 Loving the color combo in the kitchen with that bright teal/blue on a green apple wall!!! You & your sister look sooo much alike! This post was hilarious btw lol. LOVE those kitchen silhouettes! i have had similar ones on my etsy wish list for a LONG time. maybe i can convince my husband to get me a silhouette machine so i don’t have to buy the prints from etsy??? Get a blog already, Lindsey! FYI, there is a Beverly Hills in Texas, and it happens to be a small town next to Waco, where I work (and no I am not a Branch Davidian!). It is not nearly as nice as the one in Cali, you wouldn’t want to be walking alone on the streets at night…or in the day. Anyways, back when Jessica Simpson was still doing Newlyweds, her grandparents lived close to Waco, and she would come here for holidays, when she was leaving Waco on the show they would always show the TX Beverly Hills city limit and then transition to the CA Beverly Hills sign. Which I found stupid. Haha. I loved this post. So cute and funny. And I adore your sisters kitchen art. Fantastic! LOVE these! 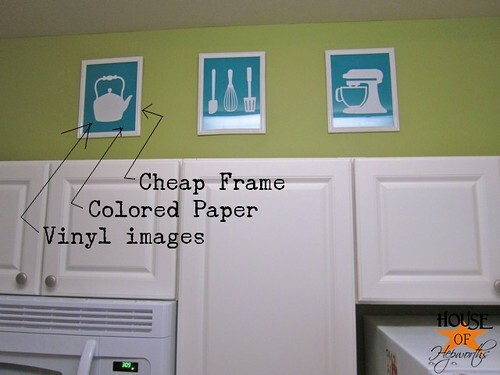 I have been looking for cute art for my kitchen and these would be perfect. Where did she get the images she cut?